Looking for coffee table books that do more than look great on your table? Bad Girls Throughout History: 100 Remarkable Women Who Changed the World, delivers on both counts. Featuring 100 women who made history, it's a book you can be proud to display in your home. Aphra Behn, first female professional writer. Sojourner Truth, women's rights activist and abolitionist. Ada Lovelace, first computer programmer. Marie Curie, first woman to win the Nobel Prize. Joan Jett, godmother of punk. The 100 revolutionary women highlighted in this gorgeously illustrated book were bad in the best sense of the word: they challenged the status quo and changed the rules for all who followed. From pirates to artists, warriors, daredevils, women in science, activists, and spies, the accomplishments of these incredible women who dared to push boundaries vary as much as the eras and places in which they effected change. 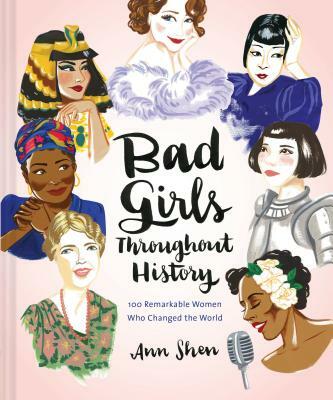 Featuring bold watercolor portraits and illuminating essays by Ann Shen, Bad Girls Throughout History is a distinctive, gift-worthy tribute to rebel girls everywhere.